I heard that from the late Red Scott. He was the CEO of Snapper Lawnmower and the CEO of Vistage Florida. Your line of credit “ain’t” cash. 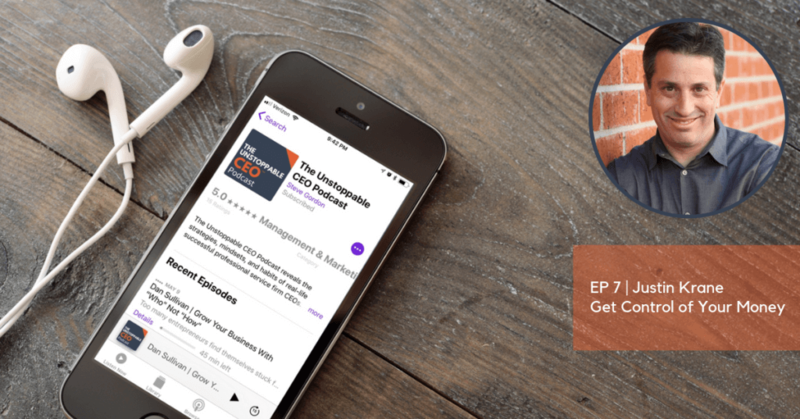 In this week’s episode of The Unstoppable CEO™ Podcast, I talk with Justin Krane,author of Money: You Got This. It’s the best guide to controlling your money, specifically written for entrepreneurs. The importance of “return on life” as a metric. Why the old “work for 50-years, then retire” model is broken. How to understand both sides of the money equation and why focusing only on cutting back is short sighted. The vital importance of paying yourself first in your business, and how to do it. How to create a plan for the money in your business. Avoiding cash flow problems…’cause cash ain’t cash, unless it’s cash! 00:12 Steve introduces Justin Krane. 04:39 Justin’s philosophy “ Return on Life” is what he considers makes him unstoppable. The opposite philosophy he got from Wall Street. 06:44 Steve points out that there isn’t the finishing line for careers there once was. 07:43 Justin explains the difference between savers and spenders. 09:28 Justin tells us how he deals out financial planning. 11:54 “Pay yourself first” – Justin explains how to create more profit. 13:34 Steve gives examples on Strategic Coaching. 14:46 Justin tells us about the importance of cashflow management and the steps you need to take. 19:12 Justin tell us how recurring revenue helps so much. 20:08 Justin goes through how he works with a client.